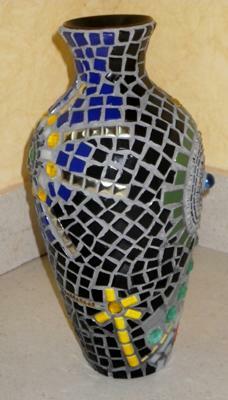 I am posting another view of my abstract mosaic vase for those that were interested. I am mainly a mixed media and collage artist so I like to experiment combining different mediums. 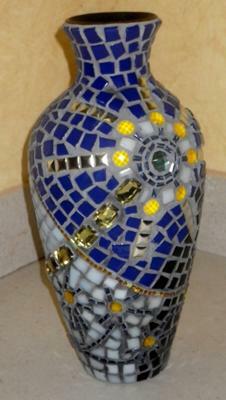 This mosaic abstract vase was mainly experimental. I used as many different types of materials as I could manage just to see how they would work in terms of application and effect afterwards. I learnt alot from doing this and expect to improve on what looked good and what didn't work so well. 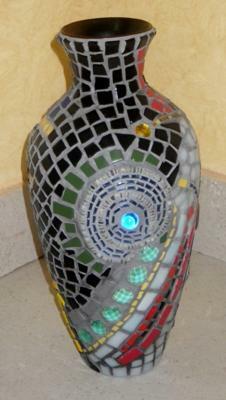 I discovered mosaic quite by accident taking my first workshop with a friend last summer. It is the perfect extension to my work in collage and mixed media. I prefer working on 3-d objects because it is challenging and I like the sculptural feel. Eventually would like to create my own 3-d objects in clay to use as a foundation- all in good time!